SAVE £59 ON YOUR NEXT MATCHDAY. Create your FREE Rewards4Cricket account to start saving for your next matchday experience. Search over 4,000 partners and collect points when shopping or betting via our website. Plus, collect points on your ticket purchases. Spend your points on International matches, county tickets, membership packages and much more. We have over 4,000 partners where you can shop and collect points. From holidays and clothing to insurance, mobile phones, groceries and wine, it's quick and easy for you to collect points. As a Rewards4Cricket member you’ll collect points on all sports bets with our betting partners. 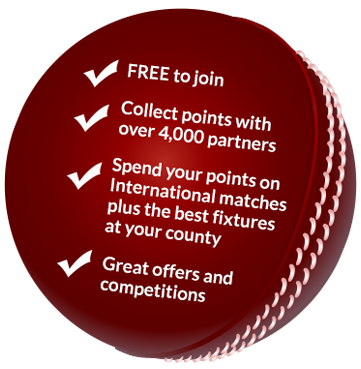 If you don’t have an account with any of our partners, sign up and deposit today to collect 2,000 Rewards4Cricket points! Simply redeem your points for a voucher from our partners. We will send your voucher to the email address on your account. You can then use the voucher with our partners. You already have an account created! Please log in to your account here. If you need assistance please contact our customer service team.